And around here, happy little feet begin with our gentle hands. Hands that meticulously craft each and every shoe for the utmost in comfort and fit. Hands that simply know how to make a better children’s shoe. So, what makes a better children’s shoe? Years of experience working with age-appropriate lasts, patterns and butter soft leathers give Umi a step up over everyone else. At Umi, all we make are children’s shoes, and we believe every step your child takes is as important as their very first. Umi big girls Radiant raises the bar on play time's cool quotient. 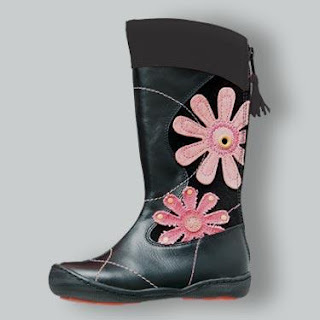 Punctuated with vivid floral designs and grommet details, this blissed out boot accommodates any occasion in her social calendar. Signature cushioned fit and back zip closure. Heading back to school in style has been made effortless this season, with the new Fall collection by Umi Children's Shoes. Showcasing great fashion's for both boy's & girl's, your sure to find something that matches your child's style preferences and personality perfectly. The princess took one look at the Girl's Radiant Boots (pictured above middle) and was in love! She chose the versatile black (also available in brown, and pink color choices), which can easily be paired with jeans or leggings.The boots include adorable details! Sued pink flowers, pink stitching details, and a tasseled zipper pull on the back of the boots, add a touch of character to the design. The convenient zipper that runs up the back of the Radiant boots make it simple for her to pull them on and off, by herself. As a parent, I can confidently look to Umi when seeking comfort, style, and impeccable quality in footwear for my children, as they NEVER disappoint! The princess is now willing the Fall weather to arrive quickly so she can wear her super cute Umi's! 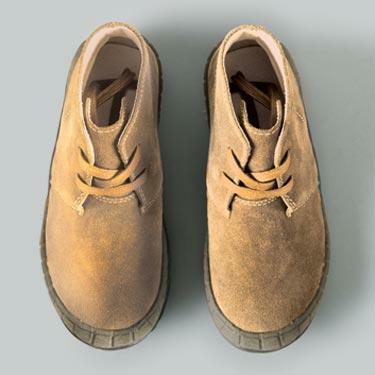 Head Back to School this year in style, with Umi children's shoes! Head Back To School In Style! One Lucky Reader will receive a pair of Umi Children's shoes of their choice! 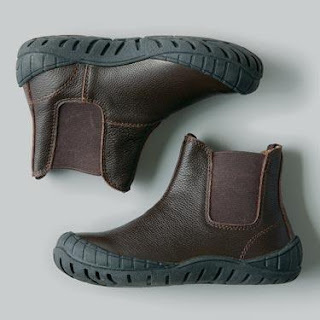 Leave a comment~ Visit http://www.umishoes.com/ and let me know which style you would love to send your child Back To School in. The comment is considered your entry. Entry to this giveaway ends on September 12, 2011.Winner's are chosen randomly through random.org.The winner will be announced within 7 days of the giveaway ending and contacted through email. The winner will have 48 hrs. to respond or another winner will be chosen. I really like the adelaide - super cute on my daughter! I'd love to send my little one with the Caaden and I am a public follower via GFC. 41 I subscribe to your YouTube Channel. 1 I follow Umi on TWITTER. 2 I follow Umi on TWITTER. 3 I follow Umi on TWITTER. 4 I follow Umi on TWITTER. 5 I follow Umi on TWITTER. 6 I follow Umi on TWITTER. 7 I follow Umi on TWITTER. 8 I follow Umi on TWITTER. 9 I follow Umi on TWITTER. 10 I follow Umi on TWITTER. 1 I entered your Pentax Optio Giveaway. 2 I entered your Pentax Optio Giveaway. 3 I entered your Pentax Optio Giveaway. 4 I entered your Pentax Optio Giveaway. 5 I entered your Pentax Optio Giveaway. 4 I entered your HANNspree Apple HDTV Giveaway. 5 I entered your HANNspree Apple HDTV Giveaway.